Your favorite flavors, ground fresh daily. Get this 6-Pack of additional containers to make using your Kuhn Rikon Vase Spice Grinder even more convenient and easy. 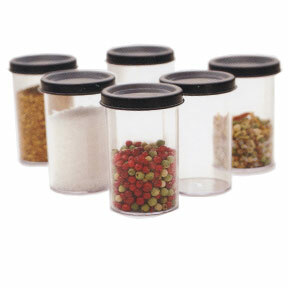 Simply fill the containers with your favorite spices and herbs and keep them stored in the air tight containers. Once needed, just pop one into the Spice Grinder for instant flavor. You can even grind up you own spice mixes, or simply use a store-bought mix. Get freshly ground salt, pepper, basil, and more in a flash. The Kuhn Rikon Vase Spice Grinder comes with three of these containers, but adding an extra six really makes the unit great. Add convenience to an already versatile gadget. Order your six-pack of additional containers today. Looking for the Spice Grinder they are designed to fit? Click here to view it now. Extra Containers for the Kuhn Rikon Vase Spice Grinder - High quality materials and superior craftsmanship make this Swiss made kitchen gadget a must have. A great accessory for anyone that enjoys cooking. Discover the easiest way to grind and store spices.